My new room still needs a lot of love. For the past few days, I've been working hard to get it up to snuff. One of my projects was to beautify my bulletin board. I was inspired by Ashley from Talk It Up. What do you think? Please note, I am not a crafty person at all. I just wanted to liven up the room a bit. The letters were made by me, I printed the letters on colored paper and cut them out (I'm on a budget). I purchased the cardboard popcorn containers from the dollar store, and found popcorn clip art and traced it onto file folders. To add a bit of a 3D effect I decided not to staple the containers flat onto the board and instead opened them up. I'm thinking of adding an "&"or a "-" in between "Speech Language" what do you think? 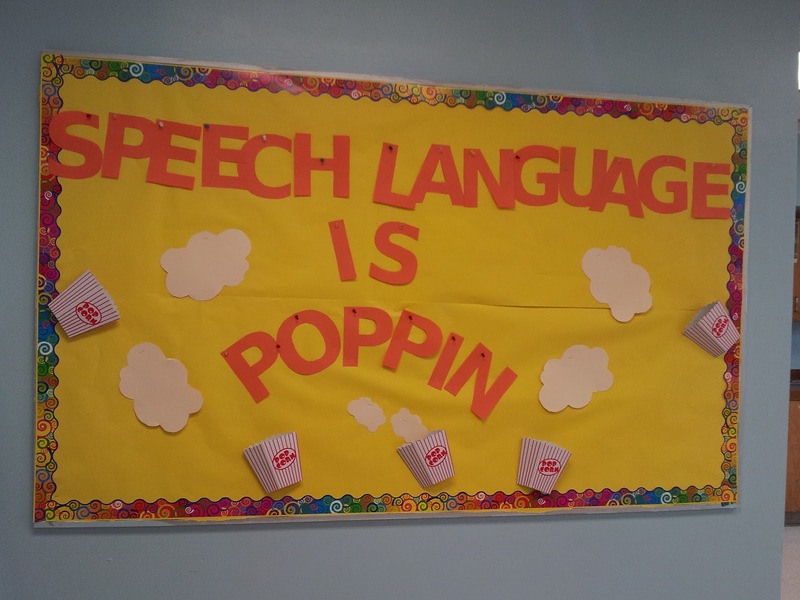 What creative ways have you made your bulletin boards relate to speech and language? Feel free to follow my Pinterest board related to bulletin board ideas! Loveeeeee. I'm also in a middle school and was wondering what I could do without making my room too babyIsh. I just got a room finally, so this is a great idea. 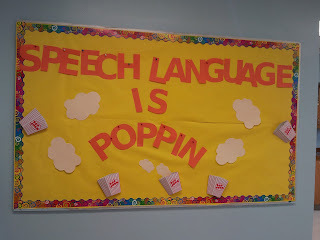 I like your bulletin board :) I work with preschool and elementary students, so I did a frog "Hop into good speech" bulletin board this year. I've been thinking of doing a popcorn board, though. Thanks for stopping by Rebecca. I really like what you are doing with your site. The drawings are nice, did you do those?